I’ve had more time for exercise and gardening and cooking this week. It’s been raining, so I didn’t plant much, but I did buy more plants. My favorite nursery is addictive, and expensive. So after I indulged there, I went to a “big box” nursery where I could get four zinnas for the price of one at the favorite. Cloudy skies make it easy to take pictures of flowers without the discipline of rising before the sun to do it. I was at church briefly yesterday, but long enough to snap these brighteners of the day. I can’t seem to help myself, and keep taking more pictures of old favorites, and whatever looks a little different from last week. It’s certainly nice to have this place to put a few samples of my catches. Occasionally I look back at old blog posts and am usually surprised at what all is stored here. Taking pictures of a few details in the incredible display the Creator puts before me every day helps me to pay closer attention. 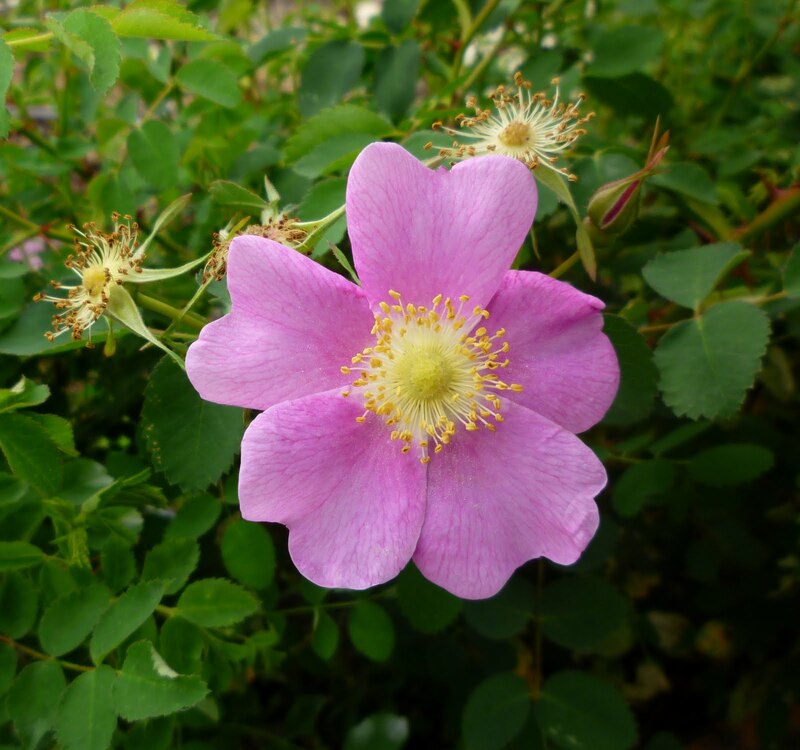 The Nootka rose doesn’t bloom for very long, and I was startled by the cheerful little faces all over the many bushes that line one sidewalk. 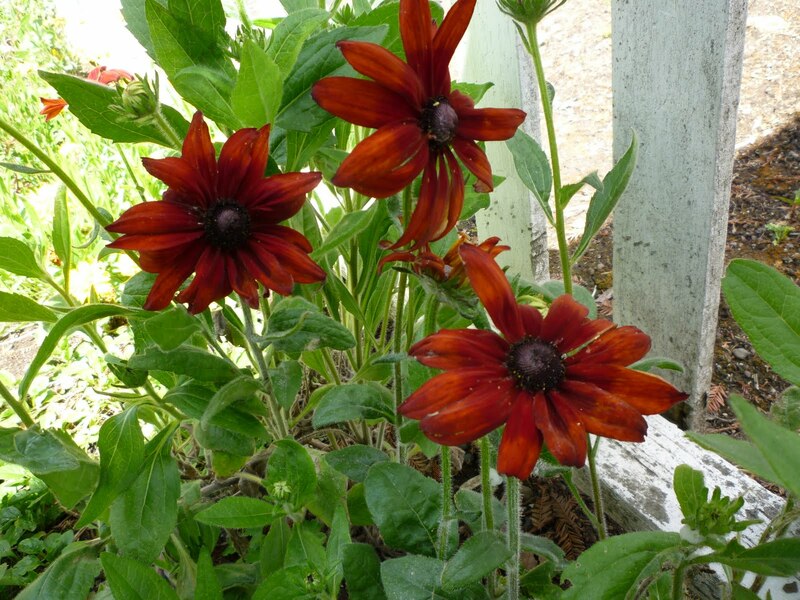 I don’t know the name of this Rudbeckia but I’d love to find one to plant at home. 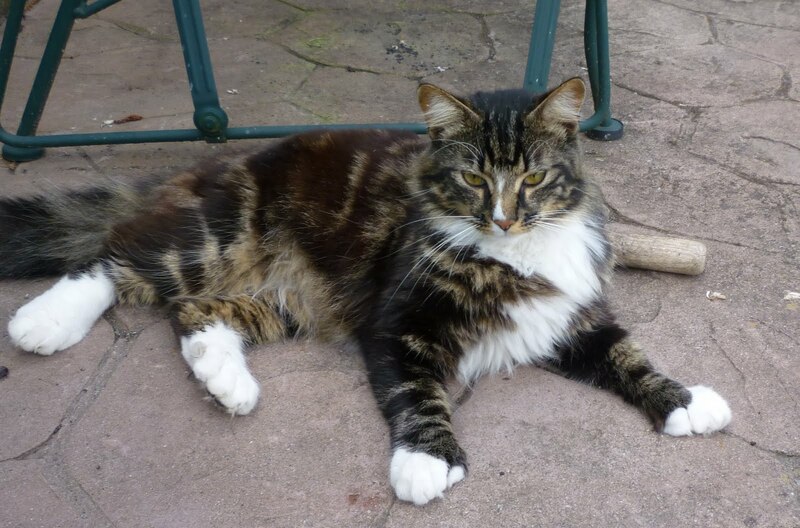 The cat visitor whom I named Boots has been very friendly. Yesterday she let me brush her for a minute. This picture shows her big feet; I named her Boots because they were all white, but now I think it’s a good name because they are large. She is so tame, she no doubt belongs to someone…maybe it’s the family down the street that has a lot of (neglected) cats. One cat we took in a very long time ago, who had kittens, ended up going back there after the kittens were all grown up. We didn’t know she actually called that place home until we had been used. But it’s o.k. We kept one of her sons and he was fully ours. Nothing special is going on in our household relative to the holiday, because B. has to work Monday. But I’m doing some cooking and shopping today, anyway. The sun is coming out…maybe next week I’ll put some plants in the ground. I am pretty wonderfully blessed to have these gardens to dig around in! More and more I’m also appreciating “having” several cats whom I can go away and forget whenever I want, and who won’t scratch up the furniture. I can concentrate more on my digging. Your Nootka is simple and sweet…does it smell as nice as it looks? 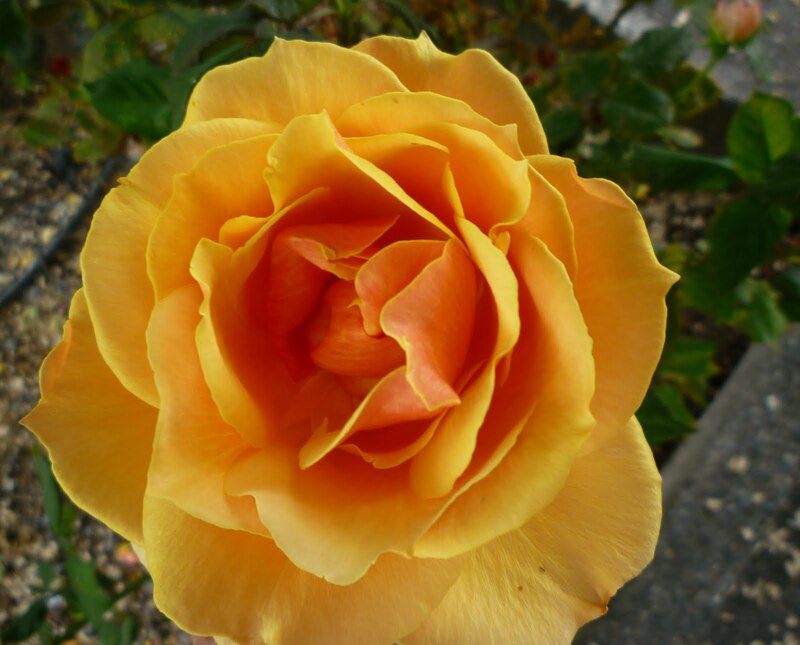 And that yellow/orange rose is stunning! Boots! Looks like he made himself at home at your place. Hmmm. Maybe he's trying to get extra nibbles? Yes, Madlibs are fun…I like taking regular stories and omitting nouns and adjectives…then we think up new ones. And making them up from scratch is also really fun! You are a nice cat friend. Boots is handsome! It's going to be cooler here this weekend, so I don't know how much gardening I'll do. I love three day weekends! I enjoyed all your observations and know what you mean about the blog as a repository and somehow also a reminder of what is delightfully in your life and before your eyes…so much to be grateful for. Lovely sweet roses! I've been digging up garden phlox to take with me when we move. I need to get one more pot of it going soon. 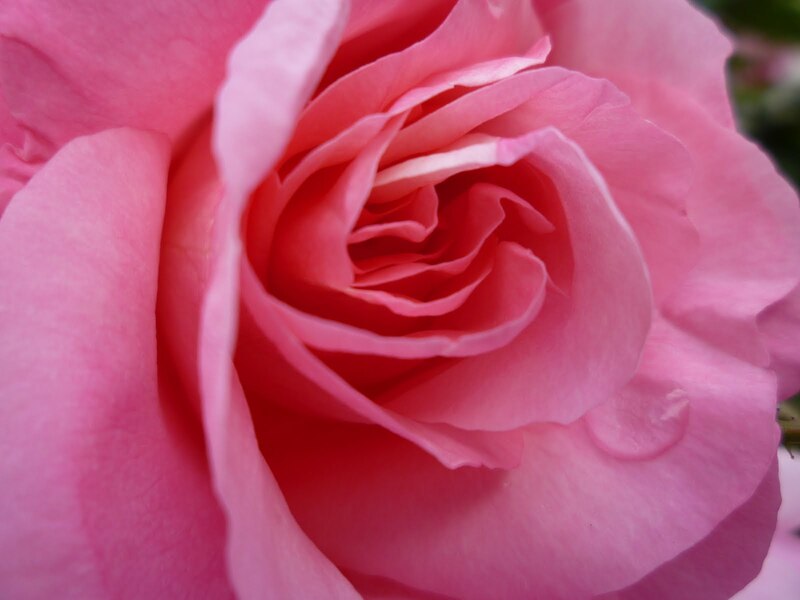 Blogging has surely made me more mindful to stop and “smell the roses” and for that I am very grateful. The forecast today for the Dallas area is to for temps to get up to 101. That seems wrong in every way, especially for May. Those are lovely roses. I love the rudbeckia, too. I've seen it, but don't remember the name. Your cat looks sweet. Thanks for your nice comment on my post about the curb beds. I take lots of photos in order to get one that turns out OK, too.